Kathryn Freeman is a painter of imagined landscapes, architecture and people. A lover of all animals, she depicts them interacting with people in a peaceable kingdom. oil on linen, 30 x 36"
oil on linen, 48 x 60"
oil on linen, 24 x 36"
oil on panel, 24 x 30"
oil on linen, 30 x 50"
The human figure is a never-ending source of inspiration for me. In my paintings I try to create harmonious order out of the confusion and randomness of everyday existence -order in which form and content merge to create a convincing world and a believable narrative. In using classical composition, I continue in the tradition of early Renaissance masters that I admire, such as Piero della Francesca, Giotto, and Masaccio. I try to distill forms, the human figure, architecture, and landscape, down to their very essence. In doing so, I hope to give them an enduring presence and universality. I am interested in transposing the literal into the metaphorical and I often use both allegory and symbolism to do so. I have always been interested in the writings of Carl Jung and the idea that there is a language of archetypal images or symbols that can be interpreted universally. There are certain images that appear repeatedly in my paintings such as dogs, birds, horses and other animals, trees, hearts, stones-all images from everyday life but also ones that kindle deeper interpretation. The settings of my paintings are almost always gleaned from my immediate surroundings and personal experiences. In all my work, the composition is structured to support and clarify the narrative, whether it is by means of a classical frieze or an arrangement of geometric forms and linear perspective. My greatest intention, and reason for painting, is to express something both meaningful and truthful about the human spirit. 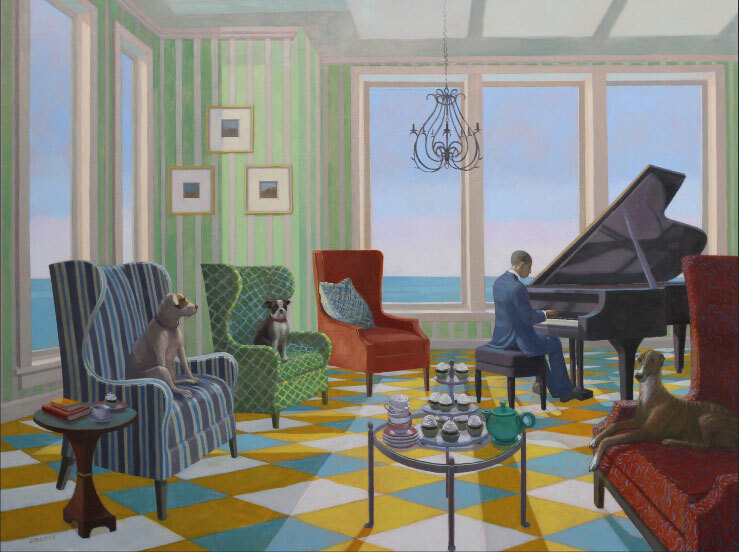 Kathryn Freeman is a highly accomplished painter and storyteller whose works show evidence of influences ranging from classicism to surrealism, magic realism to (meta) narrative, cultural archetypes to unconsciousness, rationalism to symbolism, personal anecdote to allegory, and formalism to fable. She likes color and depth. She paints both private and public subjects. She likes figure and form. She likes to invite and confuse. But most of all, she likes to compose, to see how she can resolve the many tensions she creates among and between her paintings' disparate elements-each with its own motive-to produce fabulous images. Take, for example, Mending the Tigers. Here, the image is composed of two spaces, a foreground interior space and a background exterior space. The two spaces couldn't be more unlike. The interior space is suggestive of human accomplishment. Classical elements suggest traditional and historical perspectives, the armchairs comfort, and the open book leisure and intellectual richness. However, when viewed against the backdrop of an arid line of mountains, these elements become disjoint and function as a kind of critique in which the gains of human life and culture are thrown against the bareness of the world. Is the world barren without human life and culture, or because of it? Central to the image is a procession of tigers. We have no choice but to confront them. They are Freeman's reason for painting. The tigers have literal meaning speaking to the power and beauty of the natural world. But these tigers are indoors. Again, there is disjuncture. Freeman's image directs us to enter the interior space, where we are confronted by the ferocious possibility of the tigers. However, these tigers are processional tigers, each one brought into the domestic space where they become something other than ferocious. They are moreover wounded tigers and form a line, akin to an assembly line, where they wait to be mended. Are the tigers now receiving care by the same industrializing forces that wounded them, or are these forces being repurposed in some way? Perhaps human beings are simultaneously capable of destroying the natural world and of restoring it? It's interesting to note that in Mending the Tigers Freeman offers us a female world. Are we to understand that the destruction of the natural world has something to do with masculine impulses and that its rebirth is made possible by the feminine? Answers to this and other questions are made possible by Freeman's remarkable composition. It pulls from a variety of influences to create a forum-a dialogical forum-In which everything speaks, everything matters. In this regard, Freeman's thematic and technical contraries not only disrupt her image, but also give structure to them. In all of her work, Freeman's vision is what makes resolution possible. It sees through the disparity of influences and organizes them into beautiful compositions which reward sustained examination. Kathryn Freeman is a narrative figure painter who combines classical composition with magic realism. Freeman's paintings and drawings have been exhibited in New York, London, Los Angeles, Boston, Washington and other cities in the United States and Europe. Her paintings are in numerous private and public collections and she has completed several large-scale public murals as well as private commissioned paintings and portraits. Freeman's career as a painter began when she lived and worked with her uncle, the American landscape painter Robert Jordan, in the White Mountains of New Hampshire. She continued her studies at the University of New Hampshire and completed her Master of Fine Arts degree at Brooklyn College in New York, studying with Milet Andrejevic, Lennart Andersen, Philip Pearlstein and Joseph Groell. Freeman, who works in oil on canvas in addition to gouache and pastel, began exhibiting her art with the Tatistcheff Gallery in New York in 1983. Her first show with Tatistcheff was made up of figure compositions inspired by her Brooklyn neighborhood. She left New York in 1984 to live in Warsaw, Poland, with her husband, journalist Matthew Vita. Freeman was inspired by the symbolism and allegory characteristic of Polish culture as well as the architecture and public parks in Warsaw. Among the paintings she executed during this period are "A Street has Two Sides," "A Place in the Woods," "Approaching Winter" and "January Thaw." Freeman moved to London in 1987, living first in Primrose Hill, where she painted "Virtues of Air" and "Black Bird Fly." In 1990, she moved to the Highgate neighborhood and fell in love with Hampstead Heath, where she spent many hours drawing and doing preliminary studies for her large-scale figure compositions. Some works from these years are "Upon a White Horse" and "Stolen Tartes." Freeman returned to the United States in 1993, moving to Chevy Chase, Maryland, outside of Washington, D.C. In the months after her move, Freeman completed a series of six paintings titled "Toward a Peaceable Kingdom." Set at the National Zoo, the series captured Freeman's reaction to her return to the United States after 10 years abroad. "The Gates to the Kingdom" was the central painting in this series and in her subsequent exhibition of the same title at the Tatistcheff Gallery in 1994. After the Peaceable Kingdom paintings, Freeman turned away from streets and parks and went back to one of her favorite subjects, the narrative interior, or what she calls "the painted story." In 1998, Freeman had another solo exhibition at the Tatistcheff Gallery that was titled "Sense and Sensibility." Works that were included in this show are "Piano Lessons," "Arbor Day," and "Full Moon." After this show, Freeman went outside for her subject matter again, but this time into the allegory of the garden. Freeman exhibited for the sixth and final time at the Tatistcheff Gallery in 2003, showing such works as "Goldfish Pond," "Lady in Pink with Trained Rabbits" and "Counting Sheep." Between 2003 and 2005, Freeman completed two three-story murals that grace the main staircase of the new Main Public Library in Jacksonville, Florida, designed by A.M. Stern Architects. The two monumental murals reflect the art, architecture and music of Jacksonville, in "Springfield Composition" and the literary history of the area in "Allegory of a Library." Freeman continues to live and paint in Maryland and has broadened her work to include writing and illustrating books for children and painting narrative portraits. She is currently represented by Longstreth-Goldberg Art in Naples, Florida. 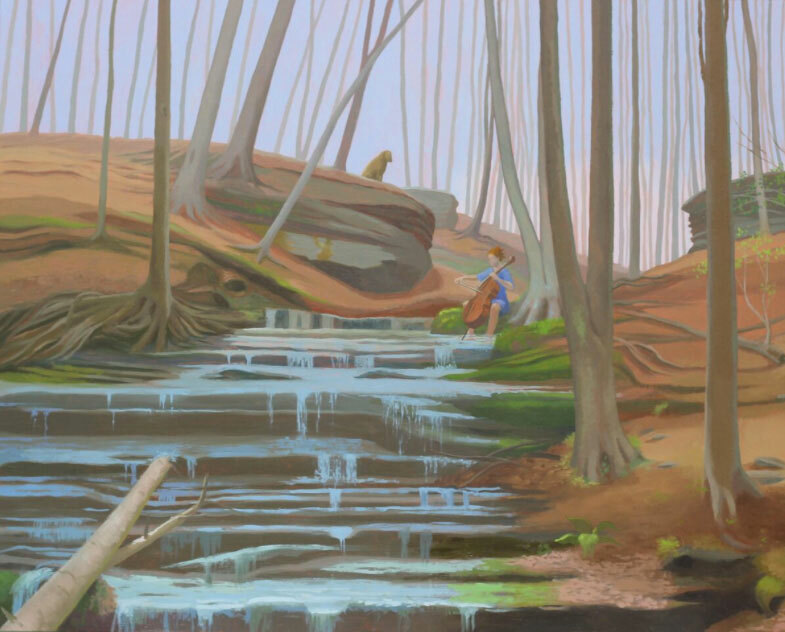 Kathryn Freeman is a narrative painter who combines classical composition with magic realism. Freeman’s paintings have been exhibited in galleries in Europe and across the United States, including New York, Los Angeles, London, Boston, Washington and Baltimore. Her paintings are in numerous private and public collections, and she has completed several large-scale public mural commissions including two, three-story murals for the Main Public Library in Jacksonville, Florida designed by AM Stern Architects. Freeman has been the recipient of an Ingram Merrill Fellowship, an Elizabeth Greenshield Foundation Fellowship and three, Maryland State Council of the Arts Individual Artist Awards. Her work has been reviewed in The New York Times, Arts Magazine, Art Forum, American Artist and numerous other publications. Freeman has also illustrated several children’s picture books including "Loon Chase", by Jean Heilprin Diehl, published by Sylvan Dell. Her latest book, “Mr. Hubbard’s Heart” is soon to be released as an app, by Authorly.com and will be available on itunes. Freeman has taught drawing and painting at the Corcoran since 1996. Previous to that she taught at the New York Academy of Art and Brooklyn College. She received her MFA from Brooklyn College and BFA from the University of New Hampshire. She also studied at the Skowhegan School of Painting and Sculpture. Kathryn Freeman. The Queen of Hearts, 1998. tempera and oil on panel, 48 x 60"
If narrative painting - or painting that seeks to tell a story - fell victim to sweeping attacks during the 20th century, one has only to look at the comic book icons of Roy Lichtenstein or the narrative conundrums of Saul Steinberg to know it never went underground for long. Despite the all-out bombardments to eradicate the narrative form 20th century painting, says artist Bo Bartlett, People are still longing for a story because they are still longing for meaning. Bur narrative painting has not been immune to the cultural battles of the century either. Gone are the religious figures of the medieval and Renaissance painters, which brought instruction, immediacy, and fresh interpretation to the Bible. Banished too, are the figures from history, mythology, and legend that artists well into the 19th century quoted as heroic models for the common man. Cultural commentators still debate when the great changes in human perception first began to take shape - and the narrative tradition began to disintegrate - but many hold the French Impressionists responsible. Rebelling against the stronghold of the academy, they not only set common men and women center stage on the canvas, but they developed a visual, nonverbal aesthetic based on the experience of "seeing" rather than "reading" a work of art. Impressionism pushed the doors wide open for radical experiments in probing topics such as greed, jealousy, and love. Kathryn Freeman's recent large figurative works can be seen as allegories. Frequently taking place in shops where people congregate, these works revolve around an incident that may seem insignificant but builds into a symbolic event. Often, the narrative is drawn from sources from ancient Greek mythology to contemporary Irish Poetry. Freeman's narrative paintings are inspired by a number of artistic sources as well. I love quoting other painters, says the thirty-four hear-old artist, whose works borrow from both the contents and pictorial arrangements of Renaissance painters Piero della Francesca, Stefano de Giovanni Sasetta, and Fra Angelico. She is also inspired by the nineteenth-century artist Puvis de Chavannes and Balthus, a contemporary French painter. Freeman's keen interest in Renaissance paintings is reflected in her emphasis on scientific perspective and on architectural elements such as doorways and columns. A recurring element in her paintings is her use of the checkerboard floor to establish a sense of space, which draws the viewer's eye deeply into the painting. Freeman also refers to Renaissance works by revealing events within the enclosed building simply be removing its walls and doorways. Although motion is implied in her work, the figures, rendered solidly, seem static and give the pictures a sense of timelessness. Many scenes are set up in such a way as to make the viewer feel as if he or she has a full view of the action, whereas the rest of the figures in the composition somehow remain oblivious to the event. The artist adds that unrelated events seen taking place all over the picture plane are intended to be perceived as not necessarily in sequence, perhaps not even in the same time span. Several years ago, after receiving her M.F.A degree from New York's Brooklyn College, Freeman moved from the Unite States with her husband, a journalist, to Warsaw, Poland, where they lived for three years. In part Freeman credits the lyrical, symbolic quality of her paintings to having lived in Poland. Since censorship there was so strict, she says, artists and writers crouched the meanings of their work in symbolic terms, and I think that, as a result, the people there tend to respond intuitively to things. The artist's recent paintings are based on actual locations in London, England, where the couple has lived for the past four years. Each of Freeman's paintings develops slowly, usually over a period of several months. She begins an oil with a small graphite drawing that she enlarges with a grid system, drawing with a thick marker on acetate. If she wants to change anything, she can easily wash part of the drawing off with a sponge. It's easy to make changes since the drawing are not precious, she explains. When she starts painting, Freeman begins with a grisaille - an under painting done in gray tones - to define the tonal structure of the work. Applied opaquely over the grisaille, the color in her paintings is often quite intense, as in Stolen Tarts which has been painted in bright reds, purples, and greens. If she needs to clarify the composition even more, she sometimes sculpts small figures in clay, upon which she then shines a light to see how the light source strikes each figure and how the figures relate to each other. In several new, smaller works Freeman has taken the influence of Renaissance paintings even further. The arches and columns of architectural environments are set starkly against the natural landscape; figures are draped in long, flowing robes. In contrast to the more contemporary, vivid colors of her larger works, these panels have been painted in muted grays, pinks, and earth colors not unlike the pale, blond tones seen in the frescoes of Piero della Francesca. Laurie S Hurwitz is the senior editor of American Artist Magazine. Kathryn Freeman is a realist painter with a strong, deadpan sense of humor and a desire to puncture holes in some revered artistic figures. For example, she brings sexuality into Fra Angelico, and she tries to drain the portentous sexuality out of Balthus. Stolen Tarts, nearly eight feet wise, is something of a parody of Balthus's Street. In Ms Freeman's French bakery, we find a Balthus scene of Parisian life, Balthus sculptural figures seen head on or in profile and a Balthus profusion of everyday incident (a cyclist drops his box of tarts and a dog tries to grab some of them in midair). There is also sexual innuendo (as when a young girl chews a bread stick and holds the bag with the other long sticks in front of her crotch). What Ms Freeman seems to be trying to do here is make Balthus's monumental figurative style safe for artists who are not obsessed with pubescent girls. How much she has to say beyond her chromatic, parodistic and iconoclastic gift remains to be seen. In this show of recent paintings, Kathryn Freeman reveals how it is still possible to capture the awe-inspiring side of human experience in one's art without falling into the pit of self-consciousness that is the bane of so many of the figurative artists working with symbolic intents. Freeman demonstrates a visionary power and passionate poetic drive in her work; she finds meaning in even the most ordinary occurrences. Inspired by her observations of everyday events, Freeman seamlessly brings together commonplace and fantastic elements. Her pictures engender astonishment; they come across as utterly convincing and mesmerizing. 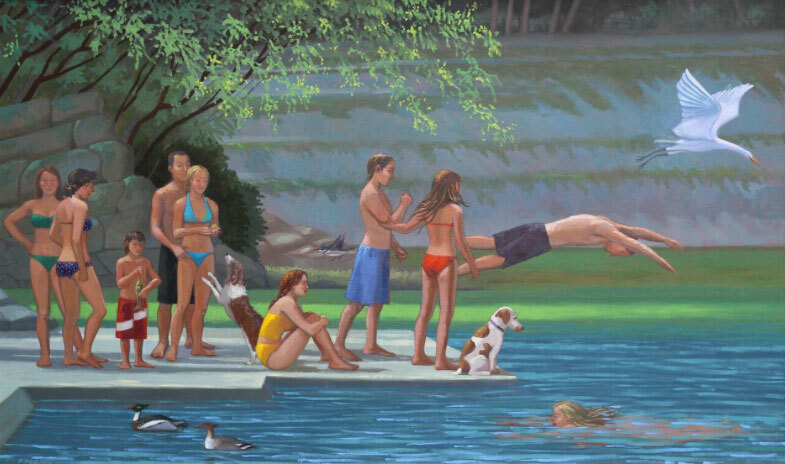 A number of the large multi figure compositions are remarkable scenes celebrating the manifold joys of being alive. Focusing on the harmony that can exist between people and nature, Freeman creates scenarios that offer a variety of fresh vantage points on the subject. In A Place in the Woods and Of Swans and Angels, both 1987, the world is presented as a park, a genteel staging ground for the discovery of life's pleasures. The solidity of the figure endows their gestures and expressions with a monumental quality; Freeman's handling of perspectival construction helps to complete the illusion of a moment in time stretched into an eternity. Through they wear contemporary articles of clothing, the figures - such as the children looking at the butterflies they are trying to catch in the former painting, or the children staring at a fish flying out of a hat in the latter - stand as universal metaphors of innocence. The paintings' details are supercharged with the element of surprise, and they thwart any pictorial expectations. Freeman plants as many conceptual bombshells in her small paintings as in her large ones. In Spring Fever, 1988, the spirit of regenerative season is expressed in the delightful image of a young woman leaping joyfully out of a window, while two comfy armchairs sit as impassive witnesses to her euphoric flight. Like this woman, Freeman's powers of invention seem to have very few bounds.